Nervous system controls and regulates the various activities of the body in multicellular organism. In this system the electrical signals are generated in the form of nerve impulse which are usually associated with the fast responses to environmental stimuli. In mammals, the nervous system consists of central nervous system, peripheral nerve system and autonomic nervous system. The central nerve system comprises the brain and the spinal cord. The peripheral nervous system includes nerves coursing between the central nervous system and different parts of the body. 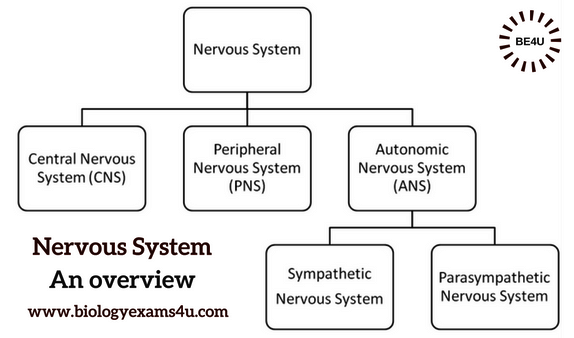 The autonomic nervous system has connections with the central nervous system but works somewhat independently to regulate the involuntary, activities like heart beat, peristalsis of intestine etc. It includes sympathetic and parasympathetic nervous system. 1. Detection of both internal environment and external environmental changes of the body. 5. Special senses such as hearing, vision, smell and taste are produced by the stimulation of a specialized set of receptor organs (sense organs), associated with the nervous system.